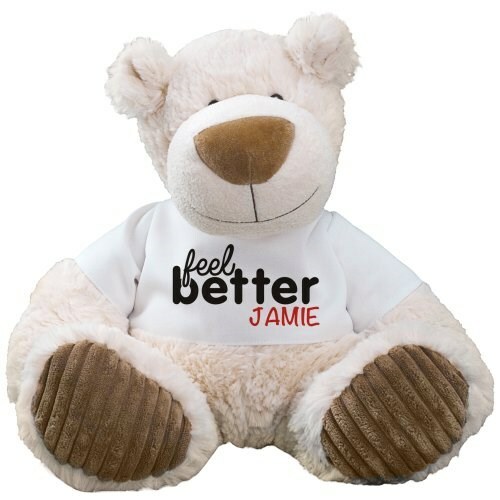 Feel Better soon Personalized Bear - Latte 12"
Give them an extra boost to feel better with this lovable teddy bear. Featuring a simple Feel Better design, our sweet Latte bear from Aurora makes an excellent addition to your teddy bear collection. Measuring 12” tall, Latte features the classic Aurora company plush animal style. Latte is a smiling bear with an oversized nose. His cream color exterior is enjoyably soft and the corduroy pads on his plush feet offer a velvety texture. Latte wears a t-shirt that we will customize for you with any name, free! Free gift wrapping and personal message are also included. Sent this gift to my 5 year old nephew who needed surgery, and he loved it. Was allowed one stuffed animal and this was his pick! The Feel Better Bear was the perfect gift I was looking for to cheer up friends that had a health set back, one of which is 97 years old. The bear is just perfect & a keepsack item. Additional Details Personalized get well bears are an adorable way to say Feel Better, and also check out personalized teddy bears for her!